Gently falling snow outside my office window is masking the internal stress of a busy day, made harder by continued school bus and schedule disruptions with the Snowmageddon storm of four days ago. There’s a saying in twelve step groups that everyone needs to spend 20 minutes a day in prayer and meditation, except for when you’re busy – in which case you double it. So while my hair’s on fire with work deliverables and attendant stress from a tough situation I’m handling professionally, it’s a worthy time to pause, and do my version of the above. It’s called Five Deep Breaths. When the kids spill the milk, when the administrators say something inane, when the spouse forgets something I told him 3 times, when the clients say some balderdash ridiculousness and I have to reply tactfully – I take a breath. When W. disrobes on the babysitter then proudly shakes her hand goodbye, as he did yesterday – as if we all shake hands buck naked – I laugh, and take a breath. When J. spends more time with his hands on his pants than on his tasks, to the point it’s publicly evident shall we say – I may wince, but I take a breath. When the health insurance rejects yet another claim and further delays its already long payment, adding one more item to the growing “when I get 15 minutes” to-do pile – I fume, butI take a breath. When I sigh remembering the person of my past, the one 10-lbs lighter and with a few less facial lines and sags, yet the one who still fits into a killer dress from time to time and has such richness and joy to relate to others, and hopefully bring to them too – I take a breath. Namaste, dear readers. The journey of the special needs parent requires lots of taking breaths, and as I take mine, I feel yours. This entry was posted in Uncategorized on January 30, 2015 by twinmom. 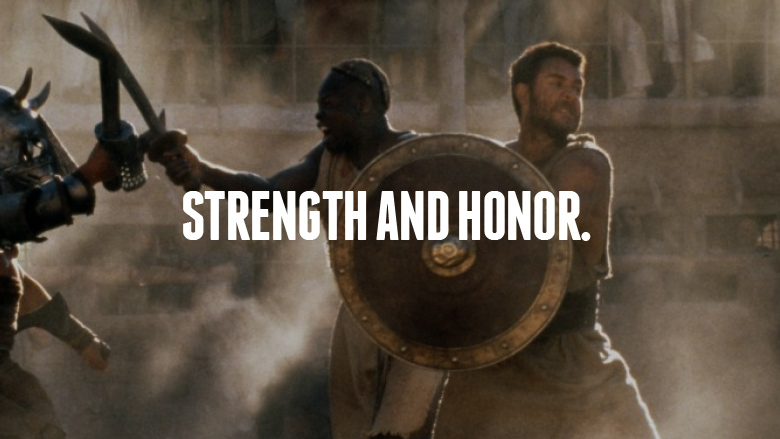 “Strength and honor!” was the battle cry of the Roman legion in last night’s rerun of “Gladiator,” the mindless movie of the night that was on TV as J. and I did needlepoint. How much that resonated for me. Strength – the experience certainly builds that, in spades, be it repeating the same elementary concept to kids who just don’t get it for the 3 millionth time, or cleaning up the grosses of bathroom messes. Or tolerating those years of disrupted sleep when the kids just can’t settle down. Or the endless school administration hassles over getting the I (individualized) in your kid’s IEP. As for Honor – i’m mindful of just how wonderful my autistic wonderboys are, at the core. Of how tremendous my staff of skills trainers and OTs and SL/Ps and teachers are, in seeing capability not disability. Of my ultra tolerant spouse who puts up with my weirdo sleep schedule which usually includes falling asleep on the sofa 2-3 night a week, leaving him to do the nightly toothbrush and floss. Of all the people I’ve met along the way who treat every human being as special, even my so obviously flawed guys (and me). Here’s hoping I can have strength and honor enough today to carry me thought- carry us all through – and help W and J to grow. This entry was posted in Uncategorized on January 29, 2015 by twinmom. 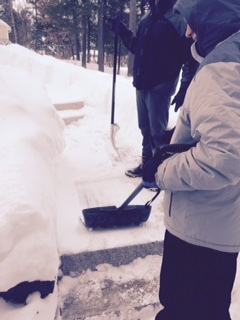 Snowmageddon 2015 here in New England continues, and as special needs parents know, it brings change in routines as well as opportunities. Amazingly we weathered the storm better than anticipated, and as always these moments bring aha moments that point the way. The snowiest, most locked in day went along better than expected, thankfully with our power and heat supply unaffected, and the boys tolerating indoor limited play options very well. With “push” and “pull” concepts among the boys’ speech goals lately, the snows provided a great opportunity to “push it – push it real good” as the silly TV commercial says. I was surprised how well both boys pushed and dumped the extra inch of snow left over after the hubby and I had plowed the first 30 or so inches before nightfall. They worked on snow shoveling very briefly last year with a skills trainer. Either they remembered well, or maybe it just came naturally. We also got lucky in that the roads were cleared pretty quickly here, so by noon on Day 2 we were out and about in search of a snowshoe location and a lunch-out treat. Car trips have always been our salvation, so when they’re not an option, I personally get squirrely. So here on Day 3, when W. doesn’t have school but J. does, I’m breathing easier knowing at least we can get out and about. After I weather a storm of any kind, be it parental, personal or even professional, I find it helpful to step back and assess. Snowmageddon showed me yet again the many wonderful things about my guys. 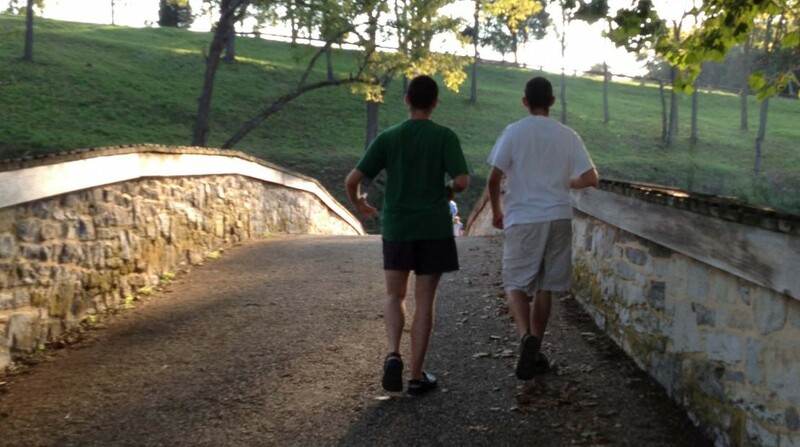 While their interests are proscribed and limited compared to a typical peer, they have pursuits they love, and a far better ability to roll with change than most profoundly affected autistic individuals – probably even better than me. We had some magical moments at night where J. in particular rediscovered needlepoint and I was so impressed with the uptick in his visual perceptual abilities to place the needle where it belonged on the next stitch. W. on the other hand, has finally realized that to get what you want, you need WORDS. And a slap on the head to Mom if she is not paying attention, although last night it was actually a stare in the face 2 inches away from me, without the slap. He still struggles to get beyond a repeated “I want……I want…..” verbally, and we still are working on the best prompt to get out of that – but for us, it’s progress and I’ll take it. We all baked too many cookies, fired up the crock pot so that the scent of something rich and wonderful wafted through the house all day long, and played Uno games and old family fun that makes me smile just thinking about it. Pushing it here for me has meant driving the clutter out of my life and setting work hours and work life so that there’s actually room for something else. Snowstorms have a way of imposing other life priorities, although technology makes it so we can never truly get away. I struck a reasonable balance, better than sometimes. A recent work setback has me grateful for doing this even more. While I really love what I do for pay, I’m crappy at setting limits in a “jump-how high?” profession. I so loved being forced, if you will, to hang out with my guys, come up with ideas for a few new speech programs based on their challenges, and marvel at how they are so very patient with their distracted, always waylaid mother. They teach me about consistency and love, more than anyone knows. I’m visualizing that snow shovel photo above and the “push it” metaphor as I segue into the day’s work. Clearing the path of the snows in my life was easier than expected this week – and is setting me up for the next opportunity from tomorrow’s oncoming storm – literally and symbolically.